Highly aromatic and deliciously spiced, this creamy, nutritious Roasted Garlic Pumpkin Soup with some crusty bread made such a comforting end to my busy day. Recently I received an offer for a stainless steel stone that’s supposed to help get rid of that garlic smell. Of course, I had to Google it and came across product after product offering relief from that garlic smell. If you like playing with garlic in the kitchen, like I do, then you know the smell that seems to linger on even after a good sudsing. Well, I might be an odd one but, I happen to like that garlic smell. Especially when the garlic I handled was roasted! Have you had the chance to enjoy roasted garlic? Roasted garlic is so easy to make. And, Google seems to have a million and one ways on how to roast it. 1) Just clean off a few of the layers of extra “skin” on a head of garlic. 2) Slice the top off of the garlic head so the pods inside are exposed. 3) Place cut head of garlic in aluminum foil. 5) bake in a 400 degree oven for 30 minutes! And boom! Squeeze those pods out of the garlic head and roasted garlic goodness is yours to have and hold! Sometimes my daughter and I mash and mix up some roasted garlic with some salt and pepper, slather it on a baguette and enjoy it. 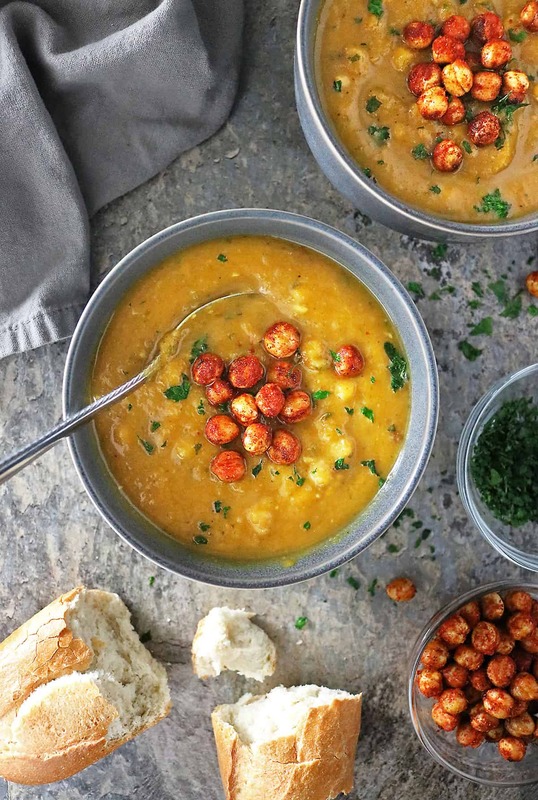 Other times, I use roasted garlic in recipes like this Roasted Garlic Pumpkin Soup. IMHO, roasted garlic adds so much flavor to a dish. I feel I don’t need to add a ton of other ingredients to tickle my tastebuds, when roasted garlic is involved. Last month when my daughter and I went apple picking, we ended up coming home with a large pumpkin. This thing was huge! But, at $4, I thought it was a steal and wasn’t going to pass on it. Only, after we placed it on our kitchen counter, I wasn’t sure how I could cut into it without going through a package of band-aids in the process. So, I figured I’d bake that whole pumpkin. After consulting Google, I made a few random, shallow cuts in it, placed it on a baking tray and baked that whole pumpkin. After a little over an hour, that baked pumpkin cut like butter! And, we had so much fresh pumpkin on our hands. I ended up subbing in fresh pumpkin for the canned pumpkin in recreating dishes like these Pumpkin Greek Yogurt Pancakes, Creamy Coconut Pumpkin Pasta and Pumpkin Curried Pork Chops! And, after all that, I still had leftover fresh pumpkin which I used to make a large pot of this Roasted Garlic Pumpkin Soup. 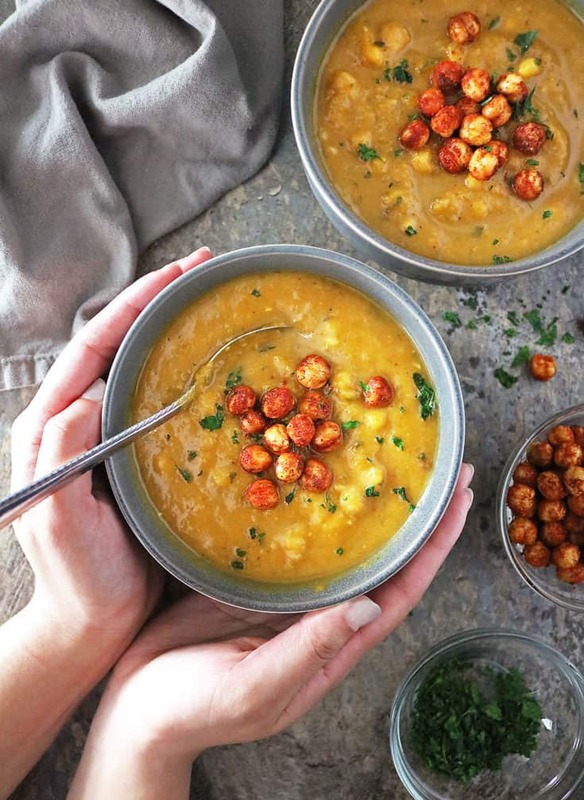 We enjoyed this soup with some crusty bread and some of these addicting Crispy Spiced Chickpeas. 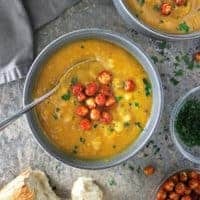 If you don’t have any fresh roasted pumpkin, no worries, just used canned 100% pure pumpkin in this soup recipe, just don’t leave out the roasted garlic. I also used a handful of spices like cumin, coriander, turmeric and chili as they seem to play off the roasted garlic and sweet pumpkin so well. 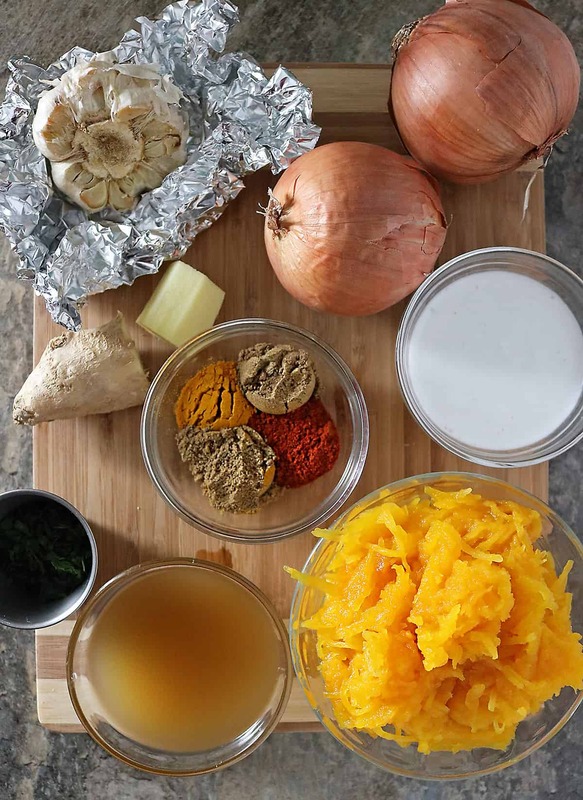 For this Roasted Garlic Pumpkin Soup, I used chicken bone broth, however, if you’d like to make a vegan version of this, you can use vegetable broth for a soup that’s just as delicious. The quantities I have listed made enough soup to last my daughter and I five nights – perfect for meal prepping in these cooler months. 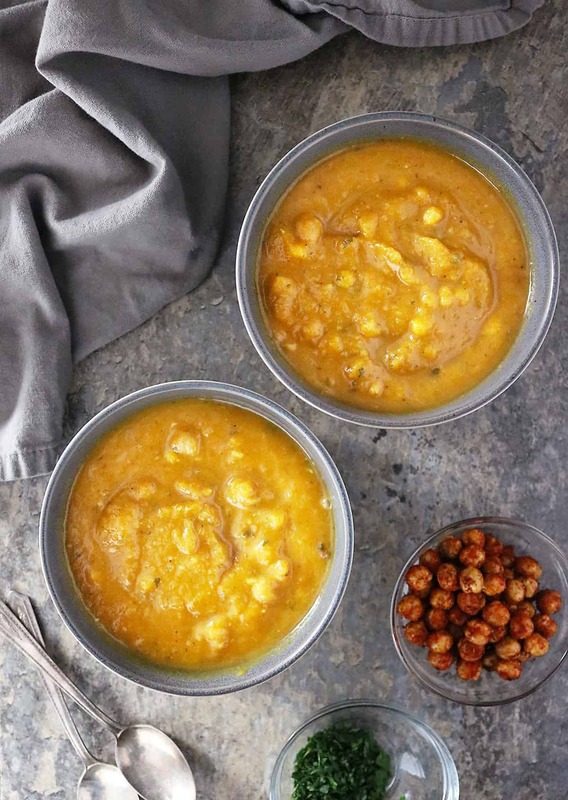 If you happen to make this Roasted Garlic Pumpkin Soup, please do let me know your thoughts on it and, if you love it, please tag #savoryspin @savoryspin on social media so I can reshare it. You can also FOLLOW ME on FACEBOOK, TWITTER, INSTAGRAM and PINTEREST to get recipe ideas and inspiration. Highly aromatic and deliciously spiced, this creamy, nutritious Roasted Garlic Pumpkin Soup with some crusty bread made such a comforting end to my hectic day. Roast your garlic head by cutting the top off it, placing it in some foil, sprinkling it with olive oil and baking it at 400 degrees for 30 minutes. When done, remove garlic from oven and foil and let cool until it can be handled. While garlic is cooling, add oil to a large, deep pan and place it over medium heat/flame. And when it's warm, add in the chopped onions. Saute onions for about 10-12 minutes stirring occasionally. Add in the roasted garlic by squeezing the garlic pods out of the skin and stir. You don't have to worry about cutting these up as we will use an immersion blender to get everything smooth towards the end. Add in the ginger and stir well. Then add in the pumpkin, bone broth, cumin, coriander, turmeric, chili powder (if using) and stir well. Cover, and let simmer about 7 minutes or so. Uncover and add in the coconut milk and stir. Take off the stovetop. Using an immersion blender (or you could add soup to a food processor/blender) blend until it is creamy and smooth. Rinse and drain corn and add it to the Roasted Garlic Pumpkin Soup too. Sprinkle in the parsley and enjoy warm with some crusty bread and more roasted chickpeas. 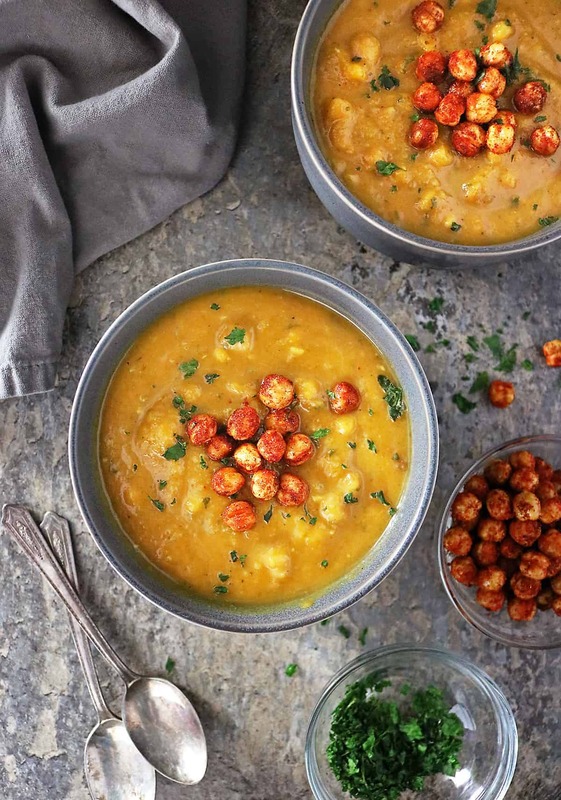 I’ve made a couple of pumpkin soup recipes this month and I can’t wait to try this one! It looks super warm and comforting! I’ve just been given some beautiful massive bulbs of garlic from the farm shop. This sounds like the perfect way to use them up! Oh yum! This sounds absolutely incredible with the addition of roasted garlic and all those spices. Definitely perfect for pairing with some crusty bread. This looks and sounds sensational! Roasted garlic is my favourite thing (I definitely eat it smeared on toast!) so I love the sound of it in this soup. So much flavour! Beautiful photos. I can imagine the delicious aroma of roasted garlic in this soup. Saving this recipe for sure. This looks seriously delicious! Love those roasted chickpeas too. Wonderful soup. The roasting of the pumpkin and of the garlic do give an added depth to this, and the flavour is good. I also added a small amount of the dried chilli flakes. This has been saved as a recipe to be made for future dinner parties…..an inspiring soup especially when served with toasted gluten-free bread, a small dob of sour cream and sprinkled with chopped chives. As you know Shashi I’m a big fan of soup. It’s one of our staples. That and curry! I use the tin foil method you describe to roast my garlic. It’s easiest that way I think. This is a lovely soup. I know Lynne and I would enjoy this as we both love roasted garlic soups! Oh, I am all in with you on the roasted garlic! We make huge batches (like 25-30 heads) and then I just freeze the roasted garlic in little ‘pouches’ of plastic wrap. That way I can pull out a roasted garlic ‘bomb’ and toss it into whatever I’m cooking…soup, pasta, etc. It’s such a unique smell and flavor, and I love it! So with that said, I’m pretty sure this pumpkin soup needs to appear on our menu sometime soon. 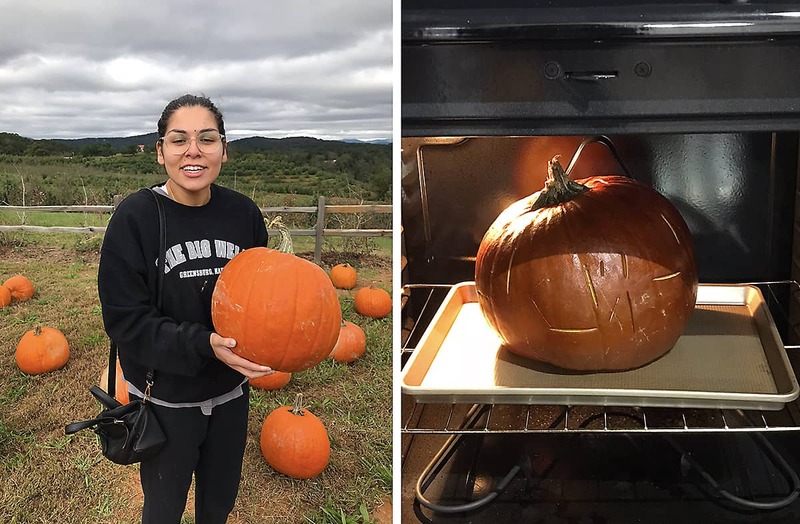 I love that you roasted an entire pumpkin, too. What a fun experiment there! We’ve already had a couple of snow storms up here, so soup is definitely on the menu for these cold nights!